This updated version of the popular Elephant Z-Stool is solid, durable, comfortable, and aesthetically pleasing. Plus, it's eco-friendly — fabricated from steel and plastic containing 30–40% recycled materials. 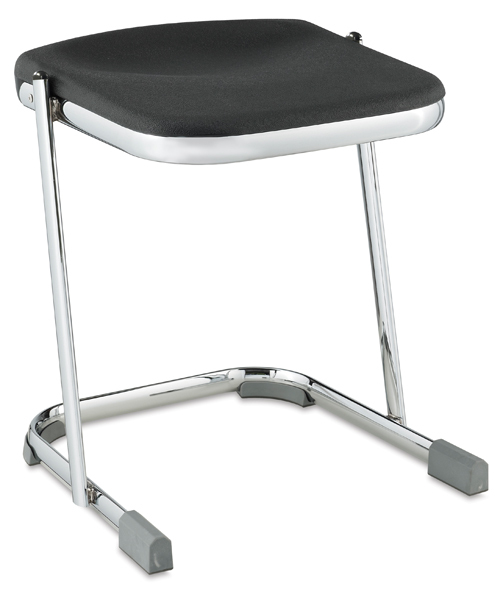 The Elephant Z-Stool features a sturdy, chrome-plated, 12-gauge tubular steel frame with a U-shaped base. This unique shape provides lots of stability and is easy to stack. These stools can even be nested on tabletops, making floor cleaning time more convenient (a bonus for schools and other institutions). The ergonomic, black molded seat is exceptionally comfortable, and the optional contoured backrest has fanback cutouts that allow air to circulate. Specially designed floor glides are attached with embedded thermoplastic polyurethane (TPU) to provide quiet, smooth gliding on all flooring surfaces — including vinyl composition tiles. The Elephant Z-Stool is offered in two styles (with or without backrest) and three heights. The base measures 16¾"W × 16¼"D.
A footrest is included on the 22"H and 24"H models.